I exited the chicken coop today with a basket containing 9 eggs. That’s been about their average lately for the 13 girls I currently have as we are pressing forward into Spring and the days are getting a little longer. Well, I forgot to turn off the light, so I turned back in a hurry, misstepped, and wiped out in the mud. Somehow 4 eggs survived the fall. Definitely one of my more graceful spills of late. I did not hurt myself. And there was no one around to witness it, so I didn’t even hurt my pride. What is it about suddenly landing on your backside that it takes a few seconds of sitting there in the mud before your brain can fully process what just happened? My first concern was for the eggs. Well, add that to my list of mud holes that need patched up this summer. I don’t know how you can live on the top of a ridgeline and have all the drainage problems that we have, but any small depression in the yard really collects the rainwater. We have a pretty thick layer of red clay in the soil strata here in this region of West Virginia. It has taken the addition of many truckloads of manure, compost and other organic matter to get my garden plot to where it drains well. It still could use more. A little rain here and there doesn’t cause much problem, but this has been a very wet winter. Last spring was very wet too and most of my cool weather crops suffered from having wet feet. Hauling truckloads of wood to the back of the house where we have a walk-out basement did a lot of damage to the yard this winter as you can see from the picture below. Between the deep snow and all the mud, we got hung up a couple of times. I have plans to remedy this though and this summer we will be making that a priority. I can tell now by looking (from off to the side) that the area circled in red there is just a bit higher than the rest of the graded area. This house was built in 1942 and did not have a basement originally. My neighbor, Charlie, owned the house at one time and told us how he put steel I-beams under the house and jacked it up off of the foundation in order to dig the basement. He built one nicest and most functional basements I’ve ever seen. It stays very dry and has none of that musty smell that often accompanies a full basement. He put in several access points to the septic system, a gray water system and lots of drains to take water away from the house. However the grade is off at that one point and the small hillsides created by the excavation all drain back into one spot. We asked Charlie to come over once and show us where all the lines are, but it’s been so long ago he can’t quite remember. 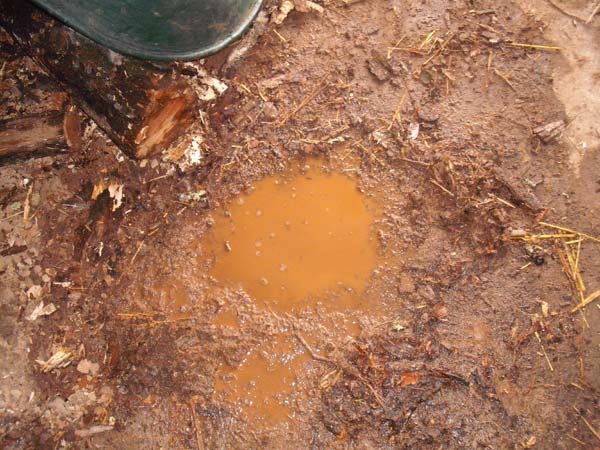 He said he thought there was a septic or drain line running right down the middle of our mud mess area. I have partially mapped out the septic lines, based on the position of the septic tank and the leech field. 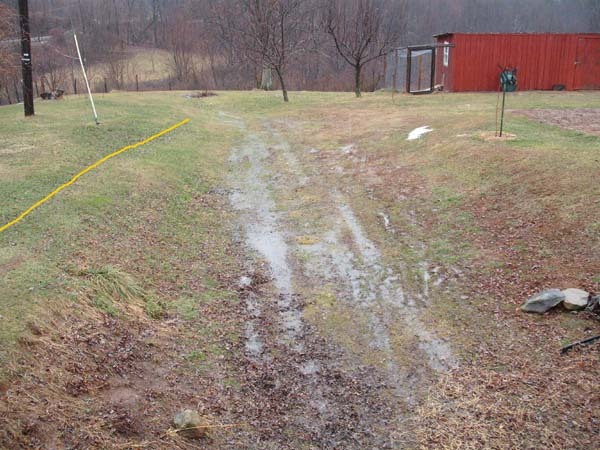 There are depressions in the yard and this photo with the yellow line shows where I think the line comes out of the tank and goes to the distributer. It’s unfortunate that the septic system takes up so much of my yard. I would plant all kinds of things (trees mostly) in that area if I could. The leach field is over the hill just beyond the chicken barn and the two apple trees in the distance and takes up about 25% of our acre. I’ve got my bees down there and I can pasture my chickens and pen one or two goats, so that is not entirely wasted space. From there, I want to put in my grape arbors on either side of the wide rock path and also work in some stone-bordered perennial flower beds. Something low maintenance, but pretty, like day lilies and iris. 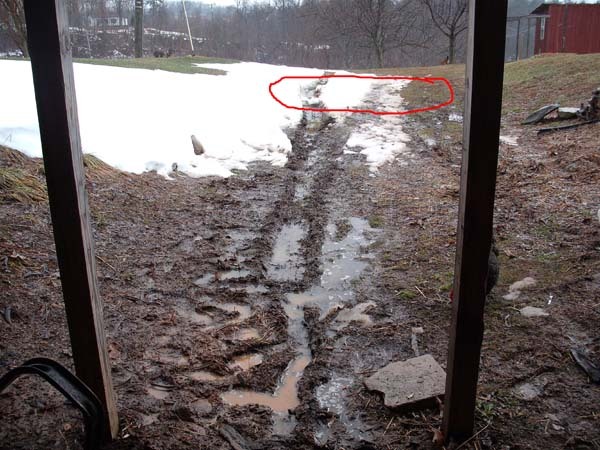 This rock path has to be sturdy enough and wide enough to back the truck in there with loads of firewood. What do you think? Any suggestions/comments will be much appreciated!